In the land of of the New England Racing Fuel Support Performer of the Week Award, that was once the realm solely of Joey Ferrigno. Over the last three seasons Ferrigno has set a trend with the award. When he wins on the track in the SK Light Modified division at Stafford Motor Speedway he wins the award. Now Ferrigno has got some company in that world of fuel award perfection in Jacob Perry. Perry, a rookie in the Mini Stock division at the New London-Waterford Speedbowl, has three victories this year on the track and now three runaway wins for the post-race award. 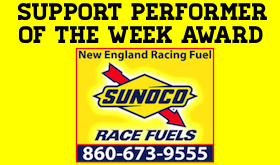 Perry once again won this week’s New England Racing Fuel Support Performer of the Week Award. Perry collected 111 of 278 votes cast this week (39.9 percent). Al Stone III, winner of the Limited Sportsman feature Saturday at the Speedbowl, was second in this week’s poll with 50 votes (18 percent). Perry will receive a $20 certificate for race fuel from New England Racing Fuel.